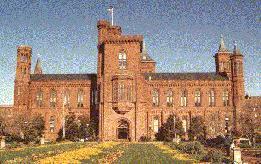 The Smithsonian Castle is part of the Smithsonian Institution and is located on the mall in Wasington D.C. It is named for English chemist James Smithson who donated the money to build the castle. The castle was finished in 1855. Today it is used as an information center for the institution.